Tonight Queen and Adam wrap up the first leg of the UK part of their tour in Nottingham home to the legend of Robin Hood and his Merry Men. This time it’s two rock legends and a merry Adam taking the stage at the Capital FM Arena. Show should start around 8:15 PM GMT. Thanks to Lisa (@weelassie11) for tonight’s great poster. She may be familiar to many of you as she has been photo-editing Adam pics for years now and has now added poster designing to her many skills! I like to watch a full concert during my treadmill! ETA: THIS CONCERT IS A KEEPER BECAUSE FREDDIE’S MUM AND SISTER WERE ATTENDING THE SHOW. THIS VIDEO SHOWS THEM THERE. 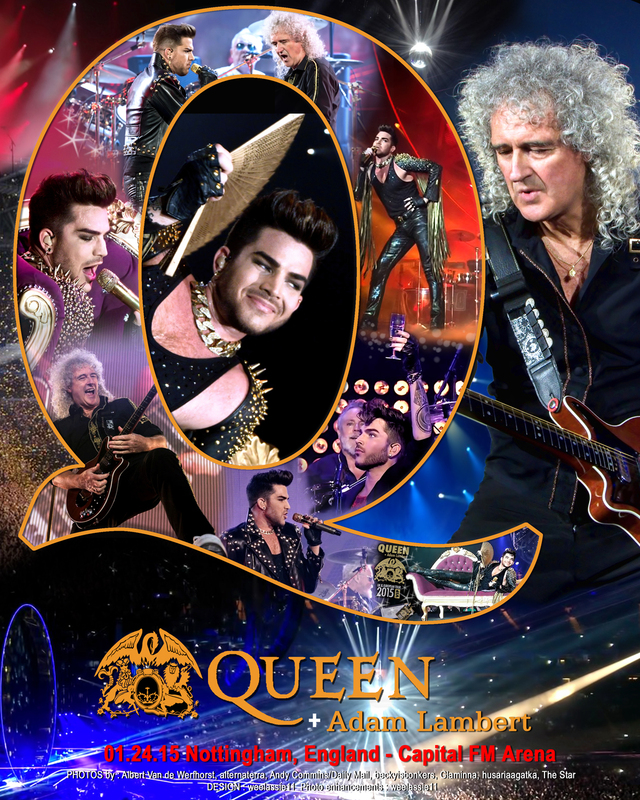 NEW EDITED: ‘Full Concert Nearly’ Queen + Adam Lambert Nottingham FM Arena 24-01-15 V5 -John Kerr https://www.youtube.com/watch?v=33vCnTPVM7A&feature=youtu.be I like to watch a full concert during my treadmill! :-D :sweat: ETA: THIS CONCERT IS A KEEPER BECAUSE FREDDIE’S MUM AND SISTER WERE ATTENDING THE SHOW. THIS VIDEO SHOWS THEM THERE.